Home / Stories / A Media Beat Up? 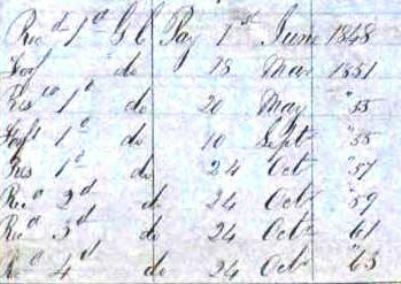 Thomas Gardiner, a young cotton spinner from Lanark, joined the 91st Regiment of Foot in 1841 at the age of 15¾ years. Before his first year was up, he was appointed drummer but boys will be boys and over the next five years of his service he was an on-again, off-again kind of drummer with a few spells in confinement. Then the serious soldiering started. Thomas was with his regiment when it was engaged in the Kaffir Wars; Thomas gained his first medal in the 2nd Kaffir War of 1846/47. There is an entry on the medal roll that suggests he did not actually receive his medal until almost ten years later when it was sent in October 1856 to the regiment he transferred into – the 79th Regiment of Foot. Thomas joined the Queen’s Own Cameron Highlanders on 1st July 1854. The regiment was already preparing for engagement in the Russian War, serving in Scutari and Varna from May that year. Thomas was with the rest of the Highland Brigade when it spent that terrible winter of 1854/55 in Balaclava. In May 1855 Thomas would have been with the expedition to Kerch and Yenikale and then returned to the trenches of Sevastopol including the assaults on 18th June and 8th September. This would earn him a second clasp on his Crimean Medal and the accompanying medal from the Turkish Emperor. The regiment returned home from the Crimea in July 1856 and only 12 months later it embarked for Bengal and upon arrival in Calcutta was forwarded by detachments to Allahabad where the regiment was collected at the end of December 1857. Under Sir Colin Campbell it served in the siege and final capture of Lucknow. Thomas Gardiner’s medal roll record shows that he was in the operations against Lucknow with the Brigadier Douglas Force and in the Oude and Rohilcund campaigns. Thomas was now in possession of four medals, the last the Indian Mutiny Medal with a clasp for Lucknow. Thomas Gardiner had four Good Conduct Badges. Only privates, drummers, trumpeters and lance corporals qualified for the badge because good conduct was already a requirement of NCOs. They were chevrons worn point-up on the lower sleeve and were awarded after a given amount of time when a soldier was clear of a regimental entry, i.e. had not been convicted of desertion, drunkenness, etc. The amount of time (and pay) accorded each badge varied over time. The soldier, if he had earned a badge, could forfeit it if he committed a regimental offence, but in time the badge could be restored. Thomas’ record shows how he gained lost and restored his badges between 1848 and 1863. All things considered, it is clear that Gardiner was a good soldier with four medals and four good conduct badges to his name and over 21 years service when he was discharged and set out for Western Australia. For this reason there were a number of comments in the press following his funeral arrangements in 1884. On 7th June, the West Australian reported: John [sic] Gardiner, an old pensioner died on Thursday afternoon at the Colonial Hospital. The deceased, who held the rank of corporal [sic] in the 79th ( Foot ) Regiment, has been ailing for some time past, and, while performing guard duty at Government House last Thursday morning, became so seriously unwell as to necessitate his instant removal to the hospital, where a few hours afterwards, the poor fellow died from the bursting of a blood vessel, during a severe paroxysm of coughing. The body, which was followed to the grave by the members of the Enrolled Force, was buried in the Church of England Cemetery, yesterday. Gardiner had been upwards of 40 years a soldier, and served in the Cape of Good Hope, the Crimea, and the Indian Mutiny. 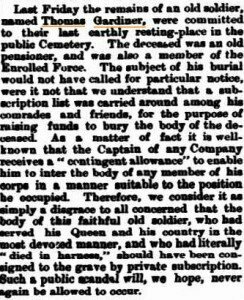 The Inquirer & Commercial News of 11th June followed up with: Last Friday the remains of an old soldier named Thomas Gardiner, were committed to their last earthly resting-place in the public Cemetery. The deceased was an old pensioner, and was also a member of the Enrolled Force. 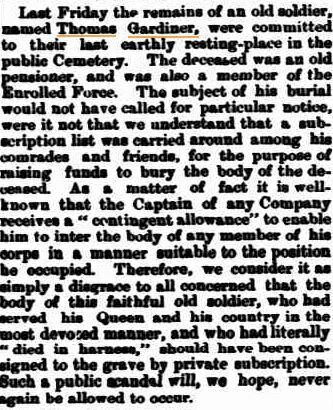 The subject of his burial would not have called for particular notice, were it not that we understand that a subscription list was carried around among his comrades and friends, for the purpose of raising funds to bury the body of the deceased. As a matter of fact it is well known that the Captain of any Company receives a “contingent allowance” to enable him to inter the body of any member of his corps in a manner suitable to the position he occupied. Therefore, we consider it as simply a disgrace to all concerned that the body of this faithful old soldier, who had served his Queen and his country in the most devoted manner, and who had literally “died in harness”, should have been consigned to the grave by private subscription. Such a public scandal will, we hope, never again be allowed to occur. The above piece appeared in ‘News in Brief’ and had no by-line. Perhaps in this 21st century, we might term it a ‘media beat up’ since the response was as follows in both the Daily News of the 12th June and the Inquirer of the 18th June. Sir, — I read with regret a paragraph in (yesterday’s) last week’s Inquirer concerning the burial of Corpl Thomas Gardiner, of the ‘Civil Guard.’ The consequences of that paragraph appearing might lead to an erroneous impression being formed, were it not for the fact that from beginning to end it is, unfortunately, a tissue of misstatements. Some years ago, when the Enrolled Duty Force was under the command of Col. Harvest, the men, to escape the torture of carrying a deceased comrade from the Barracks to the Cemetery, under a blazing noon-day summer’s sun, did raise a subscription, which amounted to about fourpence per man, and were permitted to hire the hearse. Many aged, worn-out old soldiers were on the Force in those days and the poor old fellows had quite enough to do to carry themselves such a long distance, and hence they willingly contributed their mite to escape the trying ordeal. But coming to the matter under notice, I can positively assert that instructions were given to Mr. Summers to carry out the funeral arrangements of this old hero in a befitting manner. Out of the dozen or so of men of the ‘Civil Guard’ stationed in Perth, four were on the Government House Guard, the remainder, together with a few comrades from Fremantle, attended at the funeral. With such limited numbers the military display was not, of course, a brilliant pageant; but poor Gardiner was buried with the ‘honors of war,’ and, with the exception of ‘not a drum being heard, nor a funeral note’ , he had all the respect shown that it was possible to give to his remains. — Yours, FUSILIER.